← You’ve Gotta Have Heart! This is the story about how an authoritarian used the language of liberty to fool the people while inspiring them to patriotic devotion and hero worship. Let’s see how he pulled it off. After the death of Caesar, Octavian, his eighteen year old legal heir, and Antony, Caesar’s friend, shared power as the Roman world was divided between them (44-31 B.C.). Octavian ruled 43 years (29 B.C. to 14 A.D.), and remarkably, unlike his predecessors, he avoided assassination and died peacefully of old age. How did he pull that off? Octavian was smart like a fox; he understood the sentiments of the people and appealed to them. The people dreamed of the ideal Roman Republic, so Octavian made their dreams come true! He claimed he was restoring the Republic! Octavian, however, only wanted a Republic in name only, for marketing purposes; he had no intention of operating like one. The young Monarch fooled the people by camouflaging his monarchy under Republican institutions. Octavian, just like Julius Caesar, held many titles and offices. He was counsel, high priest, and “Father of the Fatherland.” He didn’t allow his term as consul extended for life, however, and he refused the title of dictator. Octavian’s offices and titles were religious, paternalistic, and majestic! 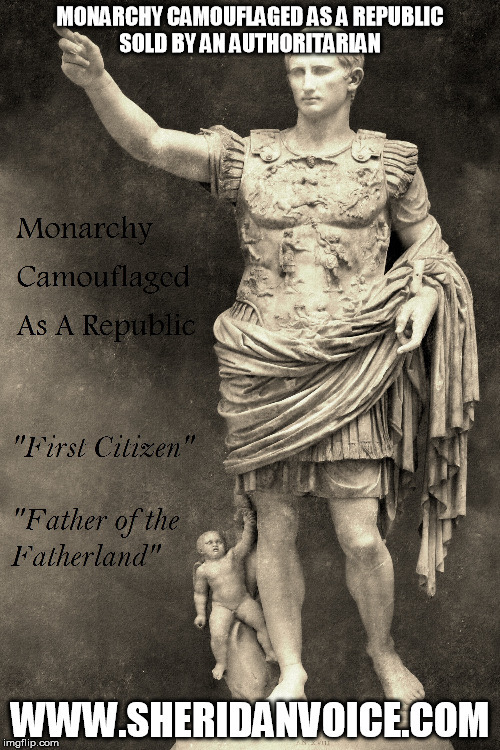 Octavian’s favorite title was his greatest camouflaging sales pitch of all, “First Citizen.” Befitting that title, Octavian refused pomp and ceremony living like a nobleman rather than an Oriental Despot. He passed himself off as a “Man of the People.” To further the illusion that he was creating a Republic, Octavian returned law-making powers and control of the provinces to the Senate. These apparent humble displays convinced the Senate and the people that Octavian wouldn’t be like a typical despot; Rome would have a Republic! All smokescreens! Octavian was an authoritarian masquerading as a noble leader. The Senate did Octavian’s bidding. He had the power to convene that body, introduce the first business at each session, and to vote any measure. Octavian had supreme command over foreign relations, issues of war and peace, city grain supplies (an essential need), the military, and the provinces. That’s how an authoritarian used the language of liberty and republic to fool the people and inspire them to patriotic devotion and hero worship. Augustus is considered one of the best administrators in history. He implemented improvement projects throughout his empire which created the Pax Romana, two hundred years of unprecedented general peace and prosperity. Are we able to discern an Authoritarian who is trying to sell us Monarchy camouflaged in the language of Liberty and Republic?